Started in 1970 as a day of education about environmental issues, Earth Day is now a globally celebrated holiday! April 22nd, Earth Day, is still effective all around the world by raising awareness about environmental issues as well as transforming the publicʼs attitude about pollution. WB Surf Camp believes in integrating philanthropy into our company structure which has given us the opportunity to give back t o environment endeavors! A huge part of our companyʼs goal is to incorporate community service, focused mainly on environmental restoration projects. Being located right at the waterʼs edge, itʼs very important to keep our ocean and beaches clean. We have teamed up with local Surfrider Foundation to help conserve and most importantly protect our gem of a coastline. 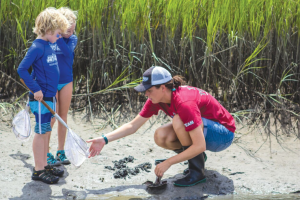 We also like to heavily integrate marine science and biology in our camping programs and lessons by teaching our campers about how important clean beaches and salt marshes are not only to us, but the animals that inhabit it. At WB Surf Camp, we make it a priority to teach about the importance of environmental conservation, for now and for time and time again! Karen Beasley Sea Turtle Rescue and Rehabilitation Center is a longtime example of our dedication to the environment around us. We partner with this amazing non-profit organization by creating volunteer groups and supporting the rehabilitation process of either sick or injured sea-turtles! 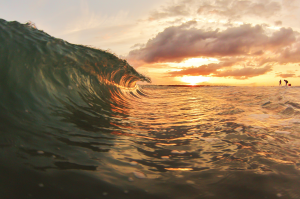 Ultimately, we want to raise compassionate awareness and pour our support into our life sustaining oceans. The Karen Beasley Sea Turtle Rescue and Rehabilitation Center is a place where many volunteer and share their love and give their time to care for just ONE aspect of our oceans, that many may take for granted. Although Earth Day comes around only once a year, its purpose and principles should be practiced 365 days out of the year! Weʼre pretty positive everyone has a place in their heart for the beach, and environment overall, so pass on the word, and continue to keep the beaches clean, our marine life safe, and the coastlines litter free!